Mother’s Day is in a week and a half! And, I’m actually on my a-game for some gift ideas. Most of the time, I don’t have any suggestions for the husband, but this year, I do! To me, jewelry should mean something. I wear it for a special reason. And I’m not all about spending a gazillion dollars on it, either. Nice, simple, and good quality is all I want. I’ve found that repeatedly with Lauren Nicole Gifts. I have several pieces from here and I love all of them! 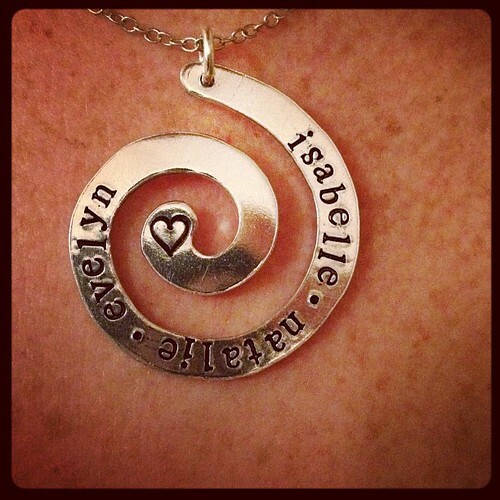 My newest favorite is a swirl necklace with my girls’ names on it. It’s so special and meaningful (and affordable, too!). I’ve had so many compliments on it that I’ve lost count. Another cool idea is this bud vase. Perfect for those flowers that your kids pick for you, but with an added bonus of meaning. You send in your pictures and they are put on the glass of the vase. I’m terrible about printing my pictures out so this would be a double whammy. With the summer coming up and trips to the pool, park, etc, a cute customized and embroidered tote works nicely. It’s huge (I know, because my three year old got in it and fit with extra room). I think it will actually hold everything we need for a family of 5 to go to the pool. Usually, we end up bringing 2-3 bags! When all else fails, there’s always the good old fashioned massage, manicure/pedicure combo, or even a haircut and pampering session. Just don’t wait until next Sunday to get a gift certificate. Do it now! Really, anything that reminds the “mom” in your life that she matters and she’s important and that you are thinking about her. running shoes, exercise clothes, appliances, kitchenwares. Even if she says she wants it, resist. Don’t do it! What’s on your Mother’s Day wish list? Maybe you’ll give me another idea/suggestion for Mr. Serious? You know he reads the comments here! love the swirl necklace! seriously. love! Pretty sure it’s my favorite piece of jewelry! Is there a ‘Sister’s Day’ or ‘Auntie’s Day’? I think there should be…and I should get the Serious family at OUT house for a whole week for both holidays! Yep, I win! OUT house? You mean OUR house, right? Oh, yeah, breakfast in bed..how could I forget that? I’ll cross my fingers for extra still kids next week for you. Is mother’s day the same day there? Is that a silly question to ask? My mothers day wish is too sad to share. Too much crazy in my life right now! Heh. I love the photo vase though. That is just too cool!